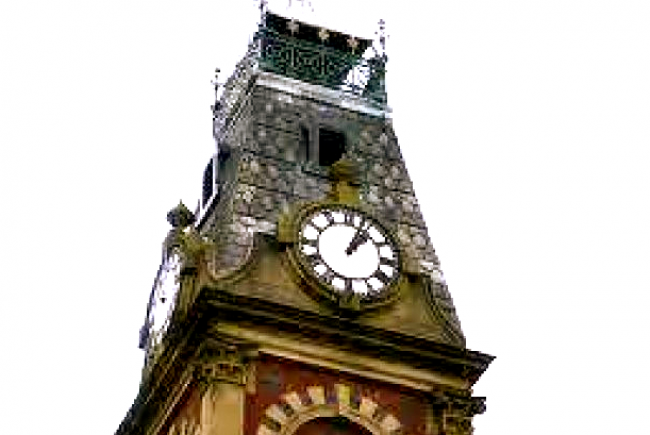 Our Victoria Market Clock has been a beacon at the heart of Stalybridge since 1868; age and budgetary pressures have taken their toll, the clock remains stopped along with civic pride . Stalybridge's Grade II listed covered market hall now houses its Civic Hall and offices. The two storey red brick building is embellished with black brick and dressed stone. The plinth courses are stone with banded rustication. The entrance façade is seven bays long, topped by a square clock tower with a steep slated roof surmounted by a cast iron crows’ nest. The Civic Hall, is located at the heart of Stalybridge & the clock tower is a landmark beacon at the heart of Stalybridge centre. The clock being stopped is a constant reminder of better times when the town centre thrived. In these times of austerity Tameside Council are not in a position to fund the repair claiming more pressing needs for their budget. Stalybridge Town Team is determined to restore the civic pride of Stalybridge in their town centre and sees this historic clock as the catalyst project to ensure this is done as quickly, visibly and cost effectively as possible. Some speak of Stalybridge in a negative manner, reminiscing about the once thriving town. Many believe that nobody cares about Stalybridge, accepting that its decline must continue. The Town Team know that many Stalybridge people do care passionately about halting this decline and sowing those required seeds of recovery which will ensure that our town begins to thrive once more. We want to show the rest of Tameside and the North West the civic pride which still burns within the hearts of Stalybridge residents regarding their town and its clock. The old Market Hall, now our Civic Centre, is a beautiful Victorian landmark building worthy of a working clock in its historic clock tower. To the local people of Stalybridge, it feels that the heart beat of the town has also stopped and if it remains in its current state, it acts like another sign that Stalybridge is falling into decline. We need your help to repair the clock, showing the rest of Tameside and the North West that the people of Stalybridge love the little town and care about its historical centre piece. The old Market Hall is now our Civic Centre, and the beautiful building deserves to be adorned with a working clock. Old Market Hall, Trinity Street. Contractor: Clock Tower Master Builders Inc. The team responsible for building or installing the project.